Tickler adds an interesting animation to your layers to achieve a stop motion feel. It is not the wiggle expression! Tickler creates choppy animation and displacement that is similar to the stop motion effect. It is not the wiggle expression. It applies animated transforms to the selected layer(s) and also adds animated displacement maps. The result is a trembling animation in which the layers change their position scale and rotation to simulate the frame difference of a hand drawn animation. It's helpful when you work on projects requiring that type of feel. 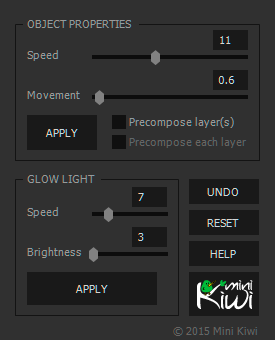 You just select a layer/layers you would like to apply the effect to, then adjust the speed and the amplitude of the animation from the sliders in Tickler. There are additional options as to whether you want the selected layer/s to be precomposed together or each layer separately. 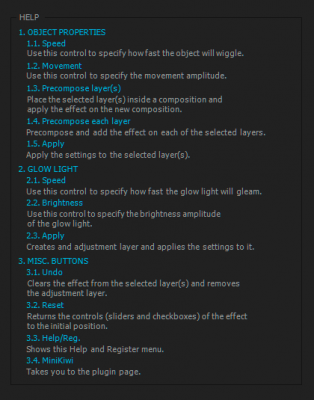 You can also add a glow effect (simulating different exposures that occur naturally in the real stopmotion animation process) choosing again the speed and the amplitude of the glow. The Undo button returns the layers in the previous state (before Tickler was applied). And if you have applied additional manipulations to the Tickler'd layers it will retain those and just remove the Tickler settings. Creates and animates a Rubik Cube. Create quick, and easy advance wave based motion on any layer in 2D or 3D. For, anything that needs to move. Offset and create a mirrored copy of the selected keyframes across multiple layers.